Not Just A Standard Pub Fare! 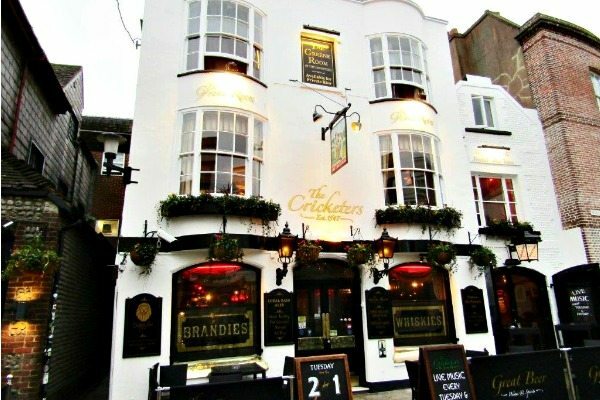 Situated in Black Lion Street, near the seafront, The Cricketers stands proud in the heart of the iconic Brighton Lanes. If you were to just happen past and wander in off the street expecting standard pub fare you would be in for a very pleasant surprise. Head Chef Phil Bartley, the talented chef who also runs the magnificent Hove Place, insists on using only the finest British produce. Phil and his team also strongly believe in animal welfare and use only traditionally farmed free-range meat and eggs and sustainably caught fish. Their beef, which is hung for a minimum of 35 days for maximum flavour, is reared in Sussex and comes from rare, slow-growing breeds. 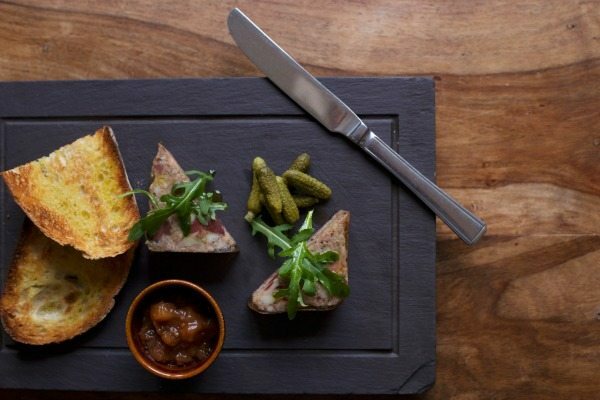 Their pork comes from free-range pigs who live out a happy existence wandering the South Downs. Their lamb comes from Standean farm in nearby Patcham and their fish is freshly caught daily by boats based in Newhaven. Aside from the excellent food, the Cricketers is also worthy of a visit for its history and, quite frankly, completely mental décor. It is a pub out of time, full of mad, eccentric, Victorian splendour. 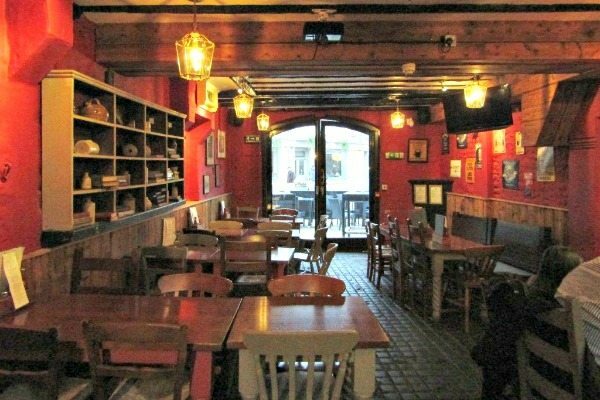 There has been a public house, in one guise or another, on the site since 1547 making The Cricketers the oldest pub in Brighton. Immortalised by Graham Greene in the classic novel Brighton Rock, this is also the place where Jack the Ripper is said to have planned his gruesome murders! Fittingly, everything inside the pub is blood red, and I mean everything, the carpet, upholstery, flock wallpaper and even the ceiling. The furniture is largely dark wood with the occasional dark, leather arm chair and there are bizarre collections of wacky knick knacks everywhere you look, including chamber pots, antique rifles, and brass dust-pans. Spooky old black and white photos of po-faced Victorians cover every free surface, including the ceiling, and a century old mounted stag head finishes the look. The net effect is that there are a hundred ghostly eyes following your every move. If vampires were real, this is where they’d hang out. It is a brilliant place to explore, I even discovered “The Cricketer”, a large, wooden carving who used to give me the fear as a child when he stood guard outside, fixed to the huge courtyard door. Not surprisingly he seems much smaller and altogether less frightening than I remember but at least I now know he wasn’t just a figment of my imagination. 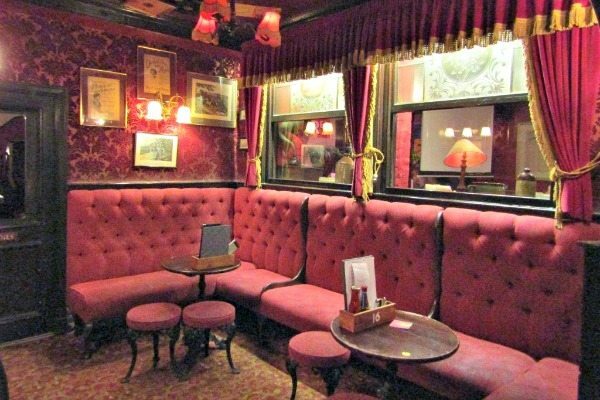 There are several distinct areas within the pub. 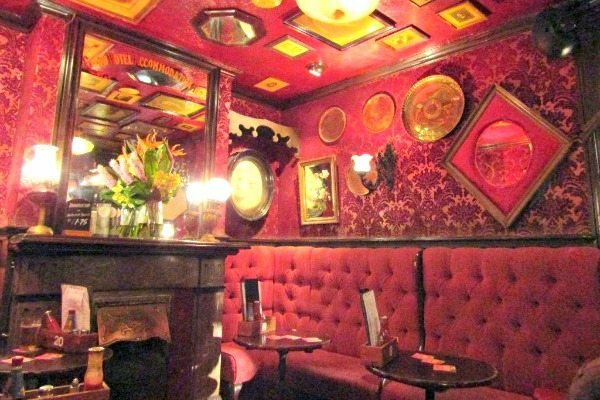 Beyond the main bar is a room which has the look of an old train carriage, with windows looking out onto the courtyard, framed by heavy red, gold-tasselled curtains. 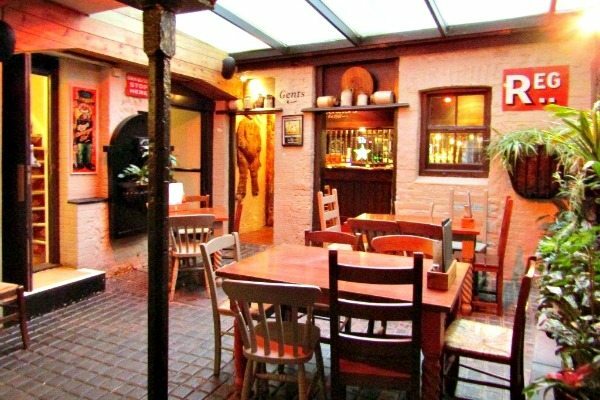 The cobblestoned courtyard is itself separated into two areas, one, a bright and airy, plant-lined conservatory and the other, a beautiful, classic, oak-beamed dining room, which has been sympathetically decorated in, you guessed it, red. The night we went the footie was on in the courtyard and live music, which is a regular feature, was being played in the bar. The Cricketers offers a vast range of real ales, which are kept to Cask Marque standard, along with an extensive wine list and any other libation you might require. We chose a bottle of Campo Flores Tempranillo, a fabulous organic red, which was fruity and light, yet smooth and warming. For starters Andrew had the spicy slow-cooked beef ribs made with ancho chilli and treacle and served with winter ‘slaw. Ancho chilli is the name given to dried Mexican Poblano chillies and it produces a warming spiciness rather than a fiery heat. Andrew was served two Flintstones-esque beef ribs, slow-cooked to tender perfection and caramelised to a deep, glossy, mahogany brown that the pictures do not do justice. They were sticky and sweet but also richly savoury and altogether absolutely mouth-watering! They were served with a healthy portion of crunchy, creamy, onion and red cabbage coleslaw and a handful of peppery greenery. I had the duck and chestnut terrine, pickled veg, plum chutney and sour dough toast. I received a substantial slice of perfectly seasoned, coarse terrine loaded with great chunks of meat and chestnuts. It was deeply satisfying and utterly delicious eaten with the lovely warm, crisp, sour dough toast and a dollop of the fabulous plum chutney. The dish was finished with delightful, crunchy, sweet pickled carrots and cauliflower florets and exquisite little cubes of tangy plum jelly. 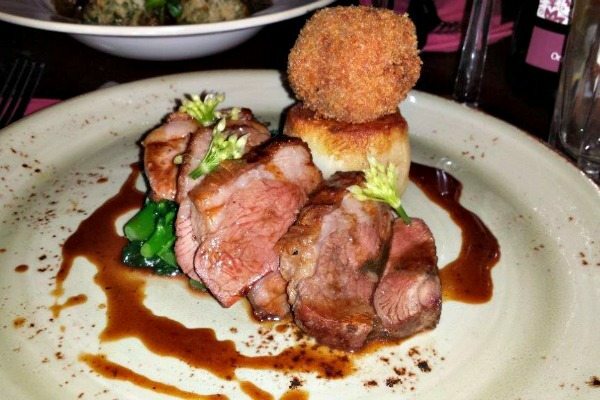 For his main Andrew opted to go for something from the specials menu, the roast rump of South Downs lamb, confit shoulder croquette, wild garlic, potato fondant and tender stem broccoli. The croquette was golden and crunchy on the outside, with a beautifully seasoned, sumptuous, moist centre. The fat on the lamb could have been rendered down a little more for my taste but the meat itself was lusciously pink and succulent. The garlic flowers were a revelation, very pretty but also packing a powerful garlic punch. The dish was finished with a soft, buttery potato fondant and a gorgeous, intense gravy. 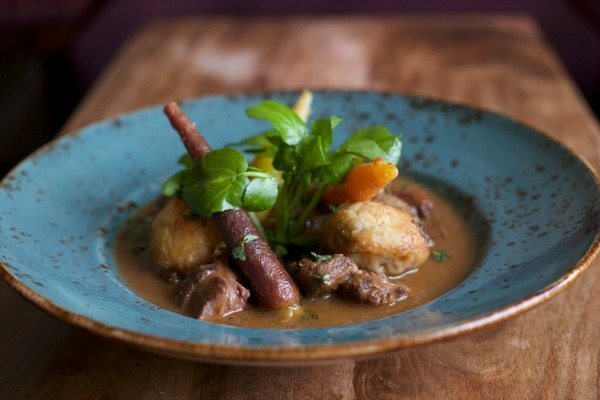 On the basis that I had never had venison before I decided to have the wild Sussex venison casserole with carrots, redcurrant, and horseradish dumplings. It was initially a little disturbing eating venison while being watched by a decapitated stag but I was soon distracted by the delicious plateful of stew in front of me. Beautifully tender chunks of earthy, slow-cooked venison in a seriously rich heart-warming sauce. It was piled high with sweet baby carrots and no less than five dumplings! The dumplings were not small either and a perfect combination of crispy on the outside and lovely and soft in the middle, salty and herby and truly scrumptious. 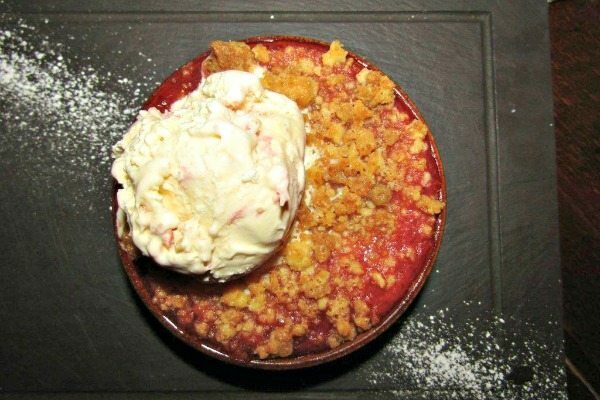 For dessert Andrew had the forced rhubarb and apple crumble with rhubarb crumble ice-cream. The rhubarb was soft, juicy and tart and the golden crumble topping was sweet and crunchy. A tried and tested combination perfectly finished with a healthy dollop of lovely soft rhubarb-rippled ice cream. 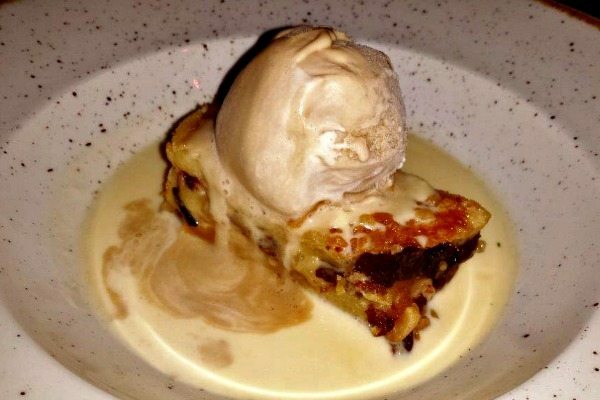 I opted for the fruit and nut bread and butter pudding with honeycomb ice cream and custard. It was comforting and yummy and the pieces of fruit and nut added extra taste and texture, which was great. It was topped with a gorgeous, smooth, honeycomb ice cream and surrounded by a moat of delicious creamy custard. The food is excellent, the portions are generous and the prices are very reasonable. The service was great; friendly, attentive and helpful. Fancy something spooky? Why not combine the Ghost Walk of the Lanes with a top notch three course meal at the Cricketers? Upstairs, in the Greene Room, there is a modern wine bar, perfect for special occasions and private events.